Alfred Hitchcock had a successful directing career in Britain that preceded his American super-stardom. Hitchcock fans rightfully consider the 1935 comedy-romance-thriller The 39 Steps among the very best works of the Master’s “British period”. 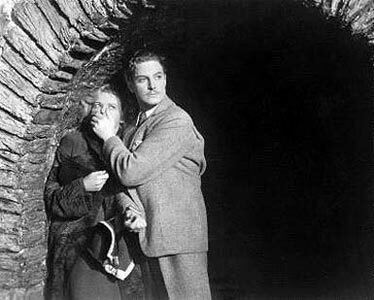 Robert Donat cuts a dash as Mr. Hannay, the hero of the film, who tries to save England from the threat of nefarious and crafty foreign agents. As in other Hitchcock films (e.g., The Wrong Man, The Man Who Knew Too Much), the central character is an innocent who is pulled into a web of intrigue and danger which he doesn’t understand. But unlike in those darker films, it doesn’t seem to bother him a jot. Madeleine Carroll, she of the other half of the handcuffs, is a perfect match for Donat in scene after scene of witty banter and growing affection. The sequence in which she goes from thinking that Hannay is a villain from whom she must escape to realizing that he is telling her the truth about the danger they both face is a clinic in how to convey emotion and character on screen with no dialogue at all. Hitchcock has been imitated so often that when viewers see his films today they sometimes say “What a clichÃ©! It’s been a done a million times before!”. Done a million times yes, but before, no. You may have that reaction to some elements of this movie. If so, be merciful: Hitchcock got there first, and no one who copied him later was as good as the original. If you live in a country with access to hulu.com and want to enjoy this exciting and delightful movie, you can do so for free here. p.s. The opening scenes with Donat and the mysterious “Miss Smith” (Lucie Mannheim) was later parodied hilariously and affectionately by Mel Brooks and Madeline Kahn in “High Anxiety“. Another great film suggestion. Unfortunately the DVD of this film I purchased a few years ago seems to have been a poor transfer. I know there was a version released by the Criterion Collection and would be interested to know if it is considerably better. Thanks for the recommendation: this seems like a film worth savouring. Homonym typo: “got their first” in the sixth paragraph should be “got there first,” I should think. Whoops, thanks for the catch will fix. “The Lady Vanishes” is excellent too. I very much agree. 39 steps is often labelled by critics as Hitchcock’s best British film, but I put it as I did here as “among the very best” mainly because of that film. Right on all counts. A terrific movie from Hitchcock’s pre-pretentious period, but I still prefer ‘The Lady Vanishes’ and ‘bad girl’ Mary Astor playing, for once, a good one. In Buchan’s book, Richard Hannay isn’t English: he’s a Scots/South African mining engineer and irregular imperial soldier, a “rough diamond”. So by the colonial stereotype, less buttoned up, more gung-ho than an Englishman of the same class. Did Donat play him as a public-school Englishman? And for the very Scottish Buchan, Hannay is definitely saving Britain and the Empire, not England. In a way he is saving them from England and its cosy complacency, as well as evil Germany. Cf. his Afrikaner hero Peter Pienaar, and the Scots Dickson McCunn and Edward Leithen. Sandy Arbuthnot is English – and comes across today as incredible, though he was based on the real Aubrey Herbert, who turned down the throne of Albania. Hi James: Most interesting! It is mentioned briefly in the movie that Hannay is from Canada, but Donat did not play him as a rough colonial diamond. Robert Donat carved a particular niche in film. Many upper class Brit sorts were portrayed in film either as sneering/condescending or as of goodly intent but out of touch and distant/staid. Donat played characters with all the upscale charm, style and diction but not a trace of snobbery. Indeed, he was the “common man toff” with whom you’d want to go down to the pub (if such a creature exists). This hit a warm spot for many Brits as well as for Americans, particular during the war years. I suspect Donat’s type would have worn thin over the post-war decades (He peaked in 1939 with this film and Goodbye Mr. Chips), but it never came to that because he died young, of a brain tumor IIRC. Buchan himself of course was also able to posh himself up, English style, when needed. He was voted into the Athenaeum in his early 30s, a remarkable feat of clubability at the time (This was even before he was ennobled). John Buchan was a protege of the great Imperial proconsul, Alfred Milner. Milner was Governor of Cape Colony during the Boer War and High Commissioner of South Africa, founder of the Union of South Africa, the forerunner of today’s Republic of South Africa. Buchan served as a young administrator in the group known as “Milner’s Kindergarten”. Milner was a key member of Lloyd George’s war cabinet 1916-1918, and Milner also served that government as Director of Information. He later became Governor General of Canada. Milner and Buchan were “Empire patriots”. One thing I recall from reading the Richard Hannay novels is that, at least in each of the first three, Buchan managed to insert at least one obvious anti-Semitic jab. This didn’t poison the fun; it seeemed to me when I read them (years ago) that the comments were inserted almost because Buchan felt that he had to, his audience would expect them. If you get a chance to see the stage adaptation, by all means do. It’s performed with only four actors: one playing Hannay, one playing the three women, and two others playing every other character with whom they interact, often playing multiple characters in the same scene.